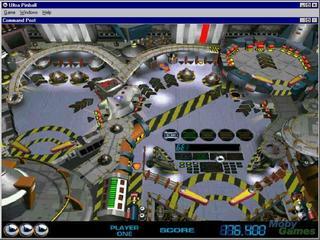 3-D Ultra Pinball is a science fiction based pinball game developed by Dynamix and published by Sierra On-Line in 1995 for Windows and Mac. 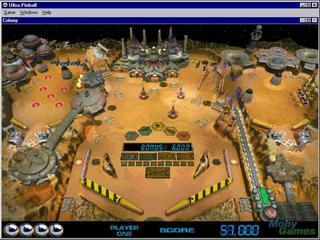 3-D Ultra Pinball is a science fiction based pinball game developed by Dynamix and published by Sierra On-Line in 1995 for Windows and Mac. This game takes the general idea of pinball and adds crazy elements into it. The game is based on a space simulation game known as Outpost (a Sierra On-Line title, 1994). You can play on three different pinball tables that you warp between. The tables are Mine, Colony, and Command Post and each have their own goals associated with them. Each table also has a set of 5 mini tables to conquer in order to complete it. Just like real pinball you have flippers that you bop the ball around with and try to score points. But Ultra Pinball takes it up a notch by adding missions and things like comets destroying sections of the board and many other random happenings. The game isn’t all about scoring points, it has a bit of a plot. You are attempting to build a spaceship and then launch it to beat the game. Though the plot is much more involved than this simple directive. The goal of Ultra Pinball was to create a fun pinball experience that you couldn’t get anywhere else and I would say they succeeded. 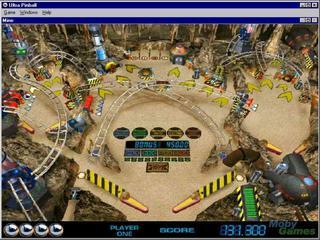 The game was praised for its graphics and the fact that it made a pinball game ‘work’ on computer. With plenty of missions to keep you busy, this game is a fun spin on traditional pinball. You may find yourself addicted, but at least you won’t have to worry about running out of quarters.